Expression of SOHLH1 and SOHLH2 in a mouse oocyte. 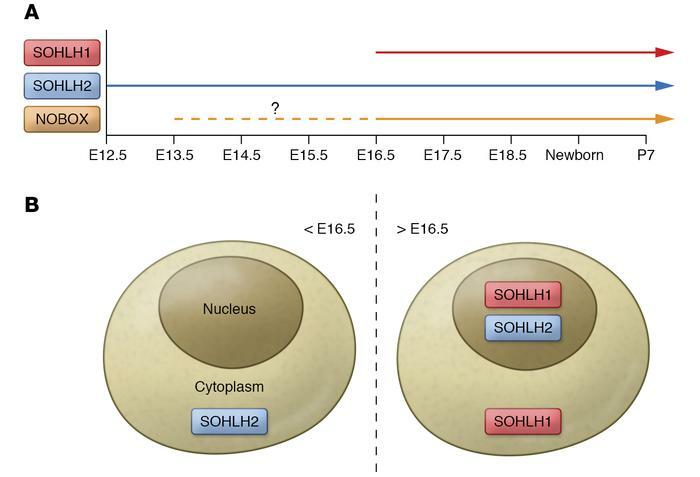 The temporal expression (A) and spatial expression (shown in the cytoplasm or the nucleus in B) of SOHLH1 and SOHLH2 proteins are distinct at different embryonic time points during oocyte development in the mouse ovary. The expression of another oocyte transcription factor, NOBOX, closely overlaps with that of SOHLH1, although its weak expression is noted at early time points (indicated by a question mark above the dashed line in A). Shin et al. demonstrate that SOHLH1 is required for nuclear localization of SOHLH2 in germ cells in the mouse ovary after, but not before, E16.5 (B).